By GreenEyedLillies on October 8th, 2008 . Filed under: Bakeries, Mail Order . You will never taste a better gourmet cupcake than our Upcakes. As a little girl, Bette would eat all the icing off the top of the cupcake and throw the rest away. Aunt Bertha could not tolerate the waste so she came up with a unique solution. She iced the top AND the sides so Bette got a bit of icing with every bite of cake. No more wasted naked cake! Upcakes are made from all natural ingredients using no transfats or partially hydrogenated oils. Using all natural ingredients and special techniques Upcakes pack a real wallop of flavor into a little cake. 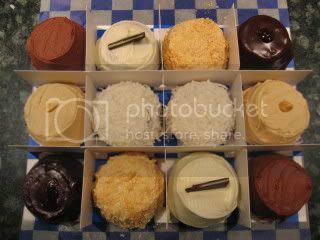 These are some of the best quality gourmet cupcakes you will ever taste!